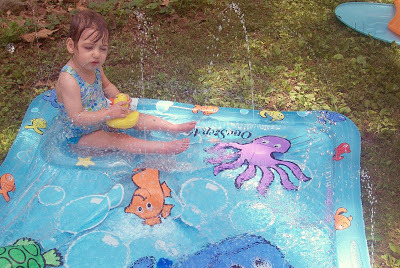 We got out what we thought was Cate’s baby pool today. Turns out, it’s not inflated with air, but rather water that shoots out of little holes once it’s full. I first I wasn’t sure, but then once it was full I decided it was pretty neat. At this point, she’s crying. 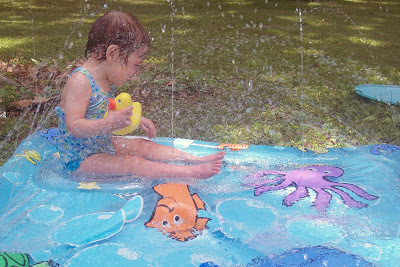 So she takes it upon herself to go away from the water. It was spraying her in the eyes most of the time, depending on how she turned. Maybe once she can stand by herself she’ll like it better. Or maybe I need to sit down with her. 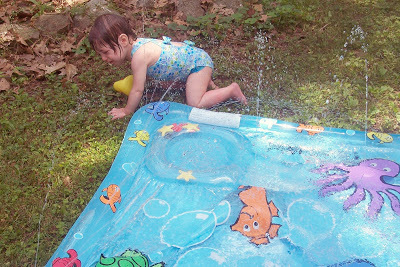 She was going to get away from that, even though it meant crawling through wet grass. She even brought the duck with her! i can’t believe it’s warm enough down there! Yesterday was pretty here, but a bit chilly when the wind blew. Today it’s just down right cold. ANd yucky. Cate’s birthday present from your mom is awesome! I was going to say the same thing as shelley – you must be having way better on that side of the state than we are… or you’re a really mean mom – HA ! That pool looks super cool. and when you DO get in with her you gotta take pics! Too funny! oops left out the word WEATHER, way better weather on that side of the state…. That’s priceless. You never can tell what they are going to HATE. Or LOVE, for that matter. In this weather, (it’s way hot down here in Alabama) I think I’d get on it with her for sure. Charlotte is loving her bath, at least. 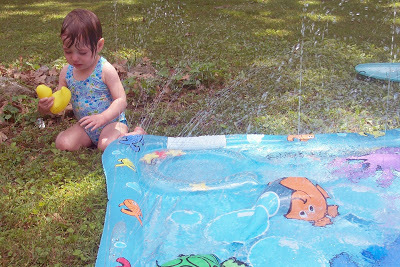 If we did it outside in a little pool, I wonder what she’d think. We’ll have to try it out.